Women decorate their home according to their own fantasies and ideas. This is one of the most expressive craft form. The flowing linear patterns on the floor of beaten clay are worked with rice paste. Different states have different names for this: it is Alpana in Bengal, Aripana in Bihar and Uttar Pradesh, Mandana in Rajasthan and Madhya Pradesh, Rangoli in Gujarat and Maharastra and Kolam in South India. The common motif is the Lotus associated with Lakshmi, Vishnu and Brahma. Very complex patterns are involved in the Kolams. 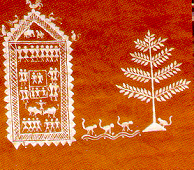 The alpanas of Bengal are rounded and the symbols are universal. They have a flowing linear pattern. The Aripanas of Bihar and Uttar Pradesh are geometric in pattern. The Kolam patterns of Karnataka, Andhra and Tamil Nadu are geometric. They are generally prepared by creating the general structure with dots and then linking them with lines or going around with them as flowing lines. In Karnataka a special kolam of sun, moon and the nine planets is prepared. The kolams of Kerala are far more complex in design and symbolism, for besides the kolams made by the women, there are the ritualistic kolams prepared by the priests. The Pulluvans of Kerala make elaborate snake kolams, like Karinagam, which are prepared for propitiating the snake gods. Not even a single day passes off in India without the observance of a festival in some corner of the country or the other. In India, festivals are associated with the changing seasons, like the different phases of the moon, with pilgrimage, with agriculture, with rituals like birth, marriage, death, ancestral worship, etc.Crafts are closely related to festivals and fairs in India. Women create a number of objects closely related to domestic rituals and ceremonies and master craftsmen prepare crafts for special occasions. Women make clay figures or idols for special rituals or to signify some ancient or ancestral happenings. Women all over the northern part of India make clay figures of Govardhan for the pooja associated with the God Govardhan. In the South, during Ganesh Chathurthi, idols of Lord Ganesh are made in all possible shapes and sizes both by the women folk and also by skilled craftsmen. These idols would be immersed in holy rivers after the pooja. In Bengal, a number of vratas, fasts undertaken by women necessitates the making of clay images. A number of ritualistic paintings are prepared on the walls of homes in India. 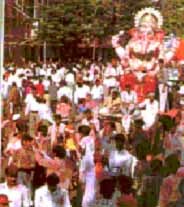 Some are for festive occasions and others are associated with rituals. 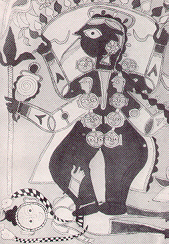 In Bihar, the murals on the house walls depict episodes from the Puranas. In certain parts of Uttar Pradesh and Rajasthan, murals are prepared on the walls merely for the purpose of decorating or embellishing them. Free- hand drawing by the women with the use of a twig and white chalk against the mud colored walls gives a gay appearance. Women in Rajasthan, Uttar Pradesh and Haryana prepare a form of low relief work on walls of the Sanjhi figure. Women prepare the basic form in cow dung on freshly plastered walls after which they fix tablets made in different colors, shapes and sizes. In Kutch district of Gujarat, bold and large mirrors are embedded in the walls. Women also make finger- free hand patterns out of mud and cow dung mixed with straw. These patterns are prepared when the plaster on the wall is wet and they have a strong textual pattern. The Punjab and Haryana women prepare Jali of unbaked clay for their homes. Weaving of baskets is an art, as ancient as pottery in India. The ancient nomadic food gatherers wove reeds together to prepare baskets to hold their food or their other collectibles. Later with the advent of different cultures, basketry took shape both for domestic and ritual purposes. Special patterns evolved according to the local traditions and techniques. 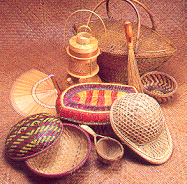 Various styles are associated with basketry. The coiled style is the most famous one. The wicker weaving technique comes next in terms of fame. Colours are rarely used in this art, yet if the item has to look impressive, bright colours are generally preferred. Colours that are applied are most of the times, natural dyes. A bundle of grass could form the material for weaving the basket. Few of the other known materials used in the weaving process are reeds and leaves that are generally dyed or bleached as per requirement before the final product is made ready. Basket weaving has gained fame in India due to the generations of various tribes, keeping this rich art alive. Commonly baskets in India are made of twigs, bamboo, cane, wild monsoon grass, and are then covered with golden grass or the dried skin of the paddy plant. Punjab is famous for its sturdy spiral baskets. A swampy wild grass called Sarkanda is basically used; it is stitched together with the use of date palm leaf. The dry date palm leaves are worked in intricate patterns. Kashmir specializes in willow baskets, the wood of which tree is famous for making cricket bats. The young twigs of the tree are woven to make different variety of baskets. Uttar Pradesh makes baskets out of monsoon grass called Moonj. Allahabad and the surrounding villages are famous for these baskets. In North Bihar, baskets are made in a coiled form with local monsoon grass, which is covered with the golden colored Sikkri grass, which is dyed according to the color desired. 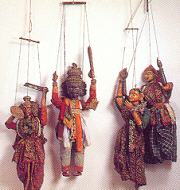 Besides baskets many toys of birds and human figures are also made in this manner. In the Terai area of Bihar the tribals weave baskets with a bolder form, which are decorated with human, and animal figures in stylized forms. The baskets are decorated with tassels made out of shells, which are presented to brides during marriage as part of their dowry items. Mysore district of Karnataka produces cane baskets. Northeastern part of India has the finest work in cane and bamboo. Even their houses are made of cane and bamboo. Bamboo baskets are used for various purposes. Whole bamboos are used for containers as the solid nodes make it a tubular container. They are used to carry water, store other liquids like rice beer, and Chang, and also for making drinking cups. The Chettiand baskets of Tamilnadu have intricate patterns made with the use of date palm leaves. These patterns are as fine as embroidery and are the specialty of the Chettiar community people of Tamilnadu. Bengal has a tradition of fine work bamboo baskets, which are used for ceremonial purposes. Winnowing baskets called Kulas are also prepared and used for winnowing. Master craftsmen also prepare special Pitaras, oval boxes, Jhampis, oblong caskets, Phul Saji, flower baskets, chalnis and sieves. Materials like reeds, grass, cane, and bamboo are used to make different types of mats throughout India. Pattamadai village in Tirunelveli Dsitrict of Tamilnadu is famous for its fine quality mats. Here the local reed is split into nearly hundred pieces and are woven on a loom with a cotton warp. The mats are so fine that they can be rolled and placed into a small box. The weaving also takes enormous time and patience on the part of the weaver. . Men and women of the Lebbai Muslim Community weave these famous mats only in this village. While the weft of the Patamadai mats is of reed, the warp is of cotton or silk, depending upon the quality required. Four strands of the 100 count are taken together to produce a single thread of great strength. Now starts the actual weaving, which is done by women. One end of this wet grass is inserted in a hole of a long fine stick, which can be compared to a huge needle. With the help of the stick, the grass is passed into the loom. Afterwards the stick and the grass is held on both sides by both hands and slightly twisted to give uniform roundness and strength. Then the reed is placed against it several times to keep it in position. After the weaving is complete, the mat is compressed to eliminate any unevenness, a process that takes at least four hours. The best mats weigh only 400 grams and can very easily be folded. They can either be single color or combined in traditional red, green and black. Kerala is famous for Kora grass mats. They carry intricate designs where black and deep maroon colors are used. The screw pine mats of Kerala are made from the fragrant Keora plant. They have a soft texture and intricate embroidery works. Manipur is famous for the red mats. They are stitched together and a border is formed at the edges. These mats are also exported. Bengal is noted for Sitalpatti mats, which are woven with green cane. The name Sitalpatti meaning cool spread, best expresses the quality of the mat. Here one set of cane in golden color is placed diagonally and another dyed maroon is placed above it in the opposite direction. The craftsmen with deft fingers plait them together to make animal and human forms. Bengal is also noted for fine quality mats made of the Madhur kothi grass. Intricate patterns are worked in by dyeing the grass a russet color. These are known as fine Maslond mats.